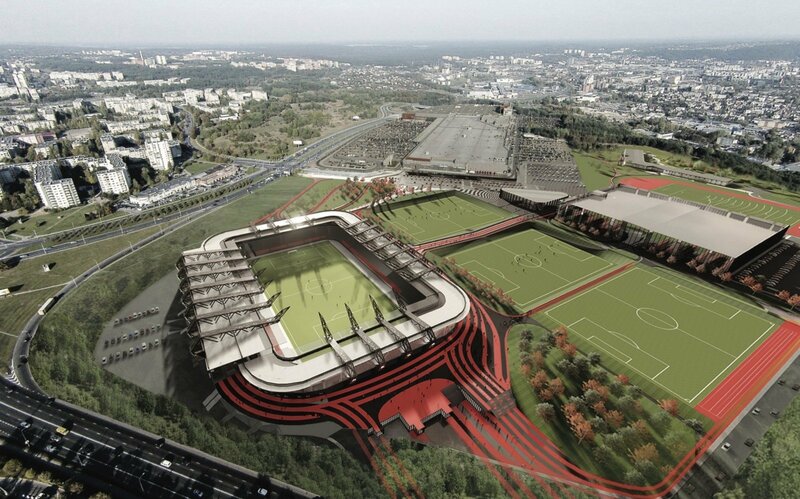 The local authority of Vilnius says it has concluded talks with a consortium led by Axis industries on the construction of a national stadium in the Lithuanian capital. "I think it is realistic to obtain approval from the municipal council this year, and to sign a contract in December or early next year," Vilnius' municipal administration director Povilas Poderskis said in a press release on Thursday. He expects the city council and the Finance Ministry to greenlight the project, opening the way for starting next year the demolition of stadium structures left over from an earlier project in Ozo Street. The first stage of the project, involving demolition and designing works, is planned to take around a year to complete. Work on the approaches to the stadium will be carried out simultaneously, with the local authority planning, among other things, to build a pedestrian overpass over nearby Ukmerges Street and a car tunnel under Ozo Street. Axis Industries, the winner of the concession contract, offered to build the national stadium complex for 79.9 million euros. In addition to a 15,000-seat football stadium, estimated to cost 33.8 million euros, the complex will include three outdoor football pitches, six indoor basketball courts, a culture center, a library, a kindergarten and a national sports museum. It will also be adapted for track-and-field and boxing events. Vilnius' local authority, which earlier planned to invest 88.45 million euros in the multifunctional complex, says after the talks that the cost of the project will total around 80 million euros, with more exact figures to be given at a later stage.